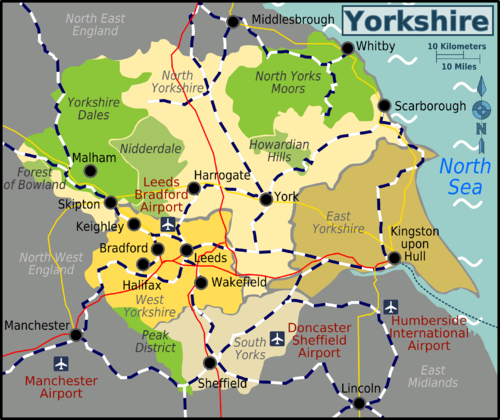 Yorkshire is the largest of the 39 historic counties of England. A long history of administrative tinkering has complicated defining what precisely is Yorkshire, with parts of the traditional ridings now being part of North East England (e.g. nearby Middlesbrough). However, the region has a strong cultural identity and offers visitors a wonderful variety of thriving urban centres, important historic towns and world famous countryside. The Humber forms a southern boundary with the East Midlands and to the west, across the Pennines, lies North West England. 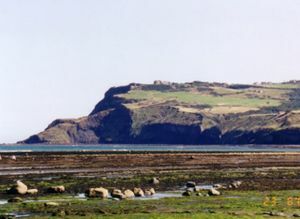 East and North Yorkshire has coastlines on the North Sea. Upper Nidderdale, one of the Dales, looking up-dale. Proudly claimed to be 'God's own county', Yorkshire's wonderous countryside, great cities and warm locals have a long history of attracting visitors. Roman Emperor Constantine I was a notable early visitor. He was proclaimed Emperor in Eboracum (today's York) in AD 306. Later, the area was popular with Danish Vikings who left their mark on the area: Eboracum became Jórvík. In 1066, the Battle of Stamford Bridge in the East Riding of Yorkshire, played an important part in the lead up to that year's main fixture, the Battle of Hastings. 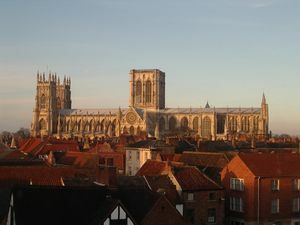 The Norman Conquest put York on the religous map when William the Conqueror looked at England and thought that a cathedral in York would be a nice counterpoint to one in Canterbury. Little did he realize that northern England had not been fully subjugated and that the cathedral's construction would require a campaign of genocide against the not so friendly locals. The overthrow of King Richard II in 1399 led to antagonisms between the Royal houses of York and Lancaster which came to a head in the Wars of the Roses, a 20 year series of conflicts. The Yorkists lost the war at the battle of Bosworth Field in 1485 but had the consolation of hosting and winning the bloodiest battle ever on English soil, the Battle of Towton (near Selby, North Yorkshire), in which 28,000 died. Leeds' industrial history took form in the 16th and 17th centuries as it was a regional centre of wool processing. Huddersfield, Hull and Sheffield were also important wool centres. Coal mining became important to West Yorkshire. 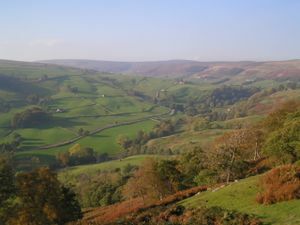 North Yorkshire retained its agricultural basis, which now complements its tourist sector. In the 19th century, Harrogate and Scarborough flourished as spa towns believed to have healing mineral waters. Both remain desirable get-aways. At this time, the industrial revolution was driven by coal, textile and steel (particularly in Sheffield). This greatly changed the way of life for many people who moved to crowded cities that lacked the infrastructure to support them. Cholera outbreaks were a big risk. The 20th century saw the decline of the industrial centres, many of which spent several decades in the wilderness. Urban regeneration projects and a shifting of corporate focus away from London has led to these towns now hosting professional services in addition to a modern industrial sector. Generally, Yorkshire folk speak quite understandable English, and even many dialect speakers have a "posh voice" that they can put on for tourists; however, some phrases may catch you out. Owt or nowt - means anything or nothing (both words can be used separately). Love - is used when greeting "Hi love" or "Yes love"
Snicket/Ginnell - The former is a covered alley, the latter an uncovered one. E.g. 'I heard him racing down the snicket!'. There are also words like "hither" "sethee" "thee" "thine" "thy" "duntha" and numerous others and if spoken as dialect is very difficult to understand by people from outside the region. Some small industrial towns in West and South Yorkshire may be more difficult to understand. However, these are not popular tourist venues. The region's major airport is Leeds Bradford Airport , which is very well connected. Doncaster Sheffield Airport  also offets flights to Europe & North America. Manchesteter Airport in North West England is also a good option for accessing South and West Yorkshire. Hull is served by Humberside International Airport, which is on the south side of the River Humber in the East Midlands. Ferries  connect Hull with Rotterdam in The Netherlands and Zeebrugge in Belgium. Buses connect central Hull with the port. Yorkshire's rail network is extensive, particularly in the more industrial south and around the Leeds conurbation http://www.nationalrail.co.uk/planmyjourney]. There are various scenic routes through the countryside and along the coast. One of the UK's most scenic rail journeys, Settle to Carlisle, starts in Settle, North Yorkshire. Wikitravel has a guide to Rail travel in the United Kingdom, including a section on the Settle-Carlisle Line. Yorkshire is well connected by motorways. The M62 runs east-west across the region and the M1 & A1(M) run north-south. There are also a number of scenic trunk road routes, including the A59 into Lancashire, and the A64 and A170 routes to Scarborough and the coast. Fountains Abbey, best preserved medieval abbey ruins in England. Yorkshire is a prime region for outdoor activities with a fantastic natural heritage and amazing scenery including three National Parks. York, Sheffield and Leeds are the most convenient bases for exploring the region and all have a wide variety of accommodation options to suit every budget. Of course, exploring Yorkshire's stunning countryside involves getting out of the towns and into the many hotels, guesthouses and B&Bs that are scattered throughout the region. Yorkshire in general is fairly safe. But like many places in the north of England, the collapse of various industries in Yorkshire has had a devastating effect on the economy, thus crime rates have become very high in some areas, mostly due to high unemployment. It's very unlikely that tourists will be victims of crime, but you should keep your wits about you if you decide to venture into areas that aren't tourist oriented. Out in the countryside there is little risk of crime (other than valuables left on view in cars in isolated places), though if going walking in winter take sensible precautions against the weather . Also make sure you have a map and compass if you decide to go off the beaten track, you can very easily get lost without them. In towns and cities, keep valuables out of sight, and stick to well-lit busy areas at night as is recommended for all UK towns and cities. This page was last edited on 17 April 2019, at 19:54.